I have a question about Tmax from clinical perspective. "A statistical evaluation of tmax is not required. However, if rapid release is claimed to be clinically relevant and of importance for onset of action or is related to adverse events, there should be no apparent difference in median tmax and its variability between test and reference product." If a fast disintegrating tab has a tmax earlier than the conventional release, does it prove that it has an earlier onset of action? Unfortunately the EMA is so allergic to a nonparametric test that it was removed from the GL. We had to accept that BE is seen a “quality measure”. Why the heck does clinical relevance come back here? » … there should be no apparent difference in median tmax and its variability between test and reference product." Oh dear! Apparent? Variability of the median? » If a fast disintegrating tab has a tmax earlier than the conventional release, does it prove that it has an earlier onset of action? Not the slightest idea. First of all, tmax is a very poor predictor of differences in the rate of absorption. 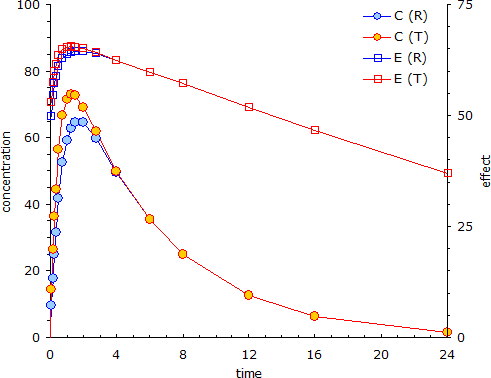 Example: One compartment model; FT=FR=1, kel 0.1733 h–1 (t½ 4 h), kabs,R 1.3863 h–1 (t½ 30 min), kabs,T 2.0794 h–1 (t½ 20 min), sigmoidal effect model identical for T and R; Emax 125, EC50 50, γ 0.25. Although T has a 50% (!) faster absorption than R, tmax of T is only 15 min earlier than the one of R (reflected both in concentrations and effects). The T/R-ratio of Cmax is 113% but the maximum effect increases by only 1.5%! Is that relevant? This is a very simple PK/PD-link model. With others (e.g., incorporating a delay in onset) the observed difference in PK may disappear completely in PD. If we have no data about the PK/PD-relationship we are left out in the dark. I’m aware of only a few studies (rapid onset for multiphasic products of zolpidem and methlyphenidate). Thanks alot Helmut for your reply and help. “According to the CHMP Guideline on the investigation of bioequivalence (CPMP/EWP/QWP/1401/98 Rev. 1/Corr**) “if rapid release is claimed to be clinically relevant and of importance for onset of action or is related to adverse events, there should be no apparent difference in median Tmax and its variability between test and reference product . For example if the therapeutic indication of the product is for short-term symptomatic treatment of mild and moderate pain. Then, as such the rate of release is clinically relevant for this immediate release product. So for such product in BE study if the median Tmax is found to be lower for the test product (1.25 hours) than for the reference product (2.00 hours) although overall ranges were similar for Tmax but median is not comparable. So with a difference of 45 minutes in median Tmax, the absorption rates of Test product and Reference are not considered comparable. Considering T/R ratios is around 100 and the statistical comparison cannot be used as an argument because the study was not necessarily powered to detect a difference in Tmax. what would be the possible reasons for this difference and how we should justify why the difference is not clinically relevant?